Looking for something to do during the lull between issues? Untold Stories of The Secret World is a MOD that allows you to play missions created by other players. As of this writing, there are 17 missions, with more on the way. Click on the links above to watch the trailer or view mission clips. But wait, there's more! The MOD also includes Untold Stories Lore that highlights fan fiction, art, music, and video creations from talented folks in the TSW community. When you are near a designated location or character, a red US icon will appear in the notification area. Click the icon to open the lore. Feeling creative? Create your own missions for others to play in The Secret World. Solon has created an easy to use mission editor, or you can work directly with the XML. If your talents are in other areas, submit "lore" for players to enjoy while in the game. More details are on this page. Installation instructions are in readme_untold.txt. 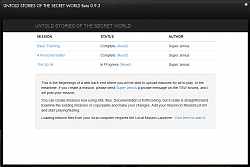 Start a mission by selecting Untold Stories from the TSW menu. Added a configuration attribute to the Looks tier, which now allows head type, hair style, eye tint, and facial hair to be set. Added a ghost attribute to the Location tier. Mission authors can now require the player to be in ghost/anima form when going to a location. Fixed an issue that prevented the timer from unloading after a PvP match or scenario. Documentation for mission authors of all new features added in version 3.0. Being Carter, an all new mission, is now available to play. It demonstrates the new features added in version 3.0. The new Looks Tier changes the appearance of the player or NPCs. The new look can be another NPC from the game (including major storyline characters), or one of your own design combining multiple looks and clothing. This tier can also be used during cinematics. The new Animation Tier allows emotes and animations to be applied to the player or NPCS. This is great for cinematics! Waypoints can now be displayed when using the Location Tier. This requires an existing mission that uses a waypoint to be active. If one is not available, an old mission from Kingsmouth will be started automatically to enable the waypoint. Missions can now be started from Untold Stories Lore. These missions can co-exist with the main mission list (started either way), or they can be "hidden" missions on lore only. Akma's Hand, an all new mission, is now available to play. It requires some of the aforementioned fixes, so version 2.3 is required to play it. Panoramas/Cinematics have been added as types of Untold Stories Lore. When you are near a panorama, click on the Lore icon to play it. Yes, this is a blatant ripoff of the Panorama feature in Age of Conan, but I figure the devs won't add it to TSW for a long time. I have placed three panoramas in Solomon Island, one in each zone (Kingsmouth, The Savage Coast, Blue Mountain). See if you can find them! Audio files, including voiceover, can now be played during missions, dialog, and cinematics. Refer to the documentation for more details. Cinematic camera paths now support "ease" functions for more natural movement. Refer to the documentation for more details. Fixes the 20 FPS lag issue introduced in 2.0. This version introduces a major new feature: Untold Stories Lore. Untold Stories Lore highlights fan fiction, art, music, and video creations from the TSW community. When you are near a designated location or character, a red US icon will appear in the notification area. Click the icon to open the lore. Mission progress may not have saved properly for some new players. This could also prevent missions from showing up in the mission list. This is now fixed. UI is now hidden after setting player rotation in a cinematic. It was previously visible during the cinematic. Documentation for writing missions is now included. Changed name of the mod from "Underground Missions" to "Untold Stories of The Secret World". I did this for two reasons: 1) I never liked the old name much. 2) The plan is to eventually expand and host non-mission content in the world, so the new name seems more fitting. See CultOfXtc's thread for some idea of what we have in mind. Created the beginnings of a new web backend for hosting player missions. In the future, you will be able to directly upload your missions for all to play. As it stands right now, I can post a new mission for others to play without them having to download a new version of the mod. Cinematic camera timing should now be consistent regardless of frame rate. Made changes/fixes to the cinematic functionality due to the removal of features from the TSW API. See http://forums.thesecretworld.com/showthread.php?t=82713 for more details. Adjusted The Scroll cinematics to account for the changes. You can now write your own missions using XML! Documentation is forthcoming, but it really is straightforward. Examine the existing missions or copy/paste and make your changes. Add your mission to MissionList.xml and start playing/testing. If you create a mission, send me the XML file. I'd love to see & play your work, and maybe even include it with the next build. Mission progress is now saved, and there's a new Status column in the mission list window. A new RESET MISSION button has been added to reset progress on missions that have been started or completed. You can now press Esc to exit a dialog tier before it is complete. You could already do this with cinematics in the previous release. Pressing the Back button now skips over cinematic tiers, so you can go back to tiers before the cinematic. Previously, you couldn't revisit tiers before the last cinematic. Note that if you still meet the requirements of the tier before the cinematic, such as having an NPC targeted or being at a certain location, the cinematic will still play. Untarget the NPC or move out of the area then press Back. The Forward button will still play cinematics, but you can always press Esc to exit it. The Scroll mission now includes cinematics and a new suprise ending for Dragon players! Some dialogue has been added/tweaked as well. The "Mission Completed" and "Mission Aborted" messages are no longer pop-ups.